This ad for L. A. Sheffield, Transfer and Storage announced an auction sale at 219 Bollingbrook St., Petersburg, Va. in 1954. L. A. Sheffield was Leon "Lee" Arvid Sheffield (1893-1979). Lee A. Sheffield was born 22 January 1893 in Dinwiddie County, Virginia, and died age 86 in Petersburg General Hospital 28 August 1979. His father was George Stephenson Sheffield (1861-1948), and his mother was Rosa Ann Hogwood (1868-1926). In the 1900 U. S. Census the family lived in Dinwiddie County where George S. Sheffield was a farmer. His son, Lee, was recorded as 8 years old, born December 1891. Another son, Major, was recorded as 3 years old, born March 1897. By the time of the 1910 U. S. Census George Sheffield had brought the family to Petersburg, where they lived at 301 South Dunlop Street. Now Lee A. was 15 years old, and Major C. 12. The two brothers, Lee A. Sheffield and Major Clixtoe Sheffield (1896-1972), registered for the World War I draft in 1917. Lee Sheffield was a farmer living in Church Road, Virginia, and Major C. Sheffield was a "steam vulcanizer" self-employed in Petersburg. Apparently both served in the navy during World War I. Then in 1924 Petersburg city directories indicate that they went into business together at the Acme Steam Vulcanizing Co., 106 West Bank St. Earlier Lee Sheffield had been in business with Guy Maitland as Sheffield & Maitland, Steam Vulcanizing, at 32 East Bank St.
Acme Steam Vulcanizing began around 1918 when the owner was recorded as H. G. Rudy. The Sheffield brothers seem to have taken over from him in the early 1920s. The 1929 Petersburg City Directory listed only M. C. Sheffield at Acme Steam Vulcanizing. The 1931 directory listed the same business under the name Acme Tire & Battery Co. They were in business under this name at 106 W. Bank St. and later at 229 N. Market St. until the late 1950s. This ad from 1953 cites Major C. Sheffield as proprietor. They are still doing vulcanizing and puncture repairs on tires. Also, sales and service on Willard Batteries. In 1958 this ad for Leete Tire & Battery Co. mentions Major C. Sheffield, who has joined this company, with 43 years "in the new tire and tire recapping field." 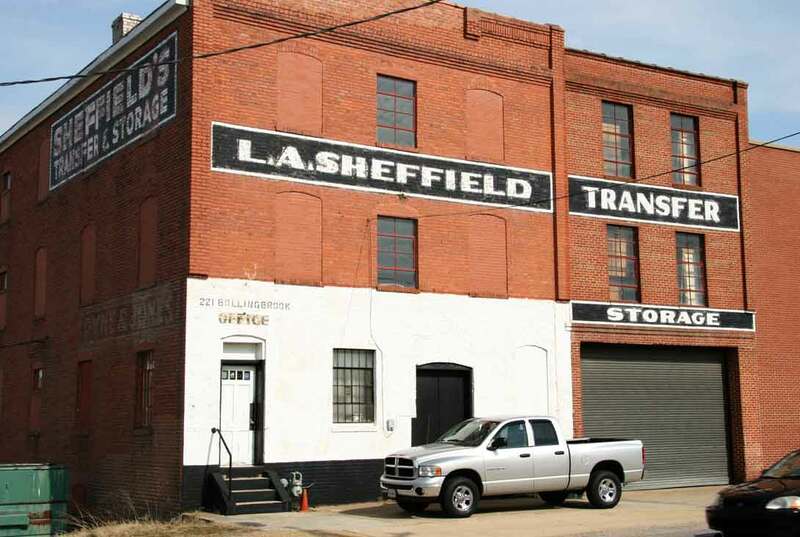 Meanwhile, Lee A. Sheffield went to work for the T. W. Mayton Transfer & Storage Co. around 1930, and then into business for himself as L. A. Sheffield Transfer & Storage at 219 Bollingbrook St. by 1937. The Petersburg city directory indicates that his son, Alvin Lee Sheffield (1932-2006), became owner in 1959. A holiday greeting from L. A. Sheffield appeared in the Petersburg Progress-Index, Christmas 1965. A sign for Pyne & Jones is found beneath Sheffield's Transfer & Storage on the side wall of 219-221 Bollingbrook St. Pyne & Jones is also on the rear wall of this building (along with Gold Medal Flour and Dolly Varden Flour). For a photo of the rear wall and the history of this company see the Pyne & Jones page.